Sorry! This is just letting non-ToorCon people know what is going on. Same as Mr Mookie. Argh. 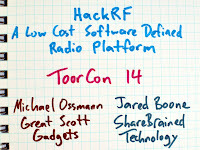 Watched the toorcon video on youtube. Great stuff! I've been dabbling with one of the cheap USB tuner dongles and SDR is a lot of fun. Being able to transmit is beyond awesome. Any change you guys will set up a kickstarter in the near future? I really want to be a part of this project. I know I'm not yet up to par on the tech. But I'm digging deep into the field itself. So I'll be following closely. Soooooooo.... when can us plebes buy one?! Can't wait to get one and start experimenting. Thanks for the support, everyone. If the beta goes well, watch for commercial availability in Q2 2013. Can you make a mailing list? That's the easiest way for my colleagues and I to stay informed on this. Major announcements about HackRF will be made on the Great Scott Gadgets announcements mailing list. Niiiice! I was looking at the schematic and the Maxim RF+ADCDAC, thinking "...wha? 2.4Ghz only? Meh!" Lovely design; totally want a pair. Mmm mmm! I will definitely be picking one of these up. Keep up the amazing work. Cheers from UTK. Hmm I wonder how difficult it would be to increase the bitrate on this, as it is the only feature looking less than ideal right now for some operations. None the less I'm eagerly keeping an eye on this one. Hello dear Michael. Sorry for reiterating all the previous posts, but still. When the device will be available for purchazing and what`s the easiest way to obtain it ?